Hi, Toni Holmes here with happy news. 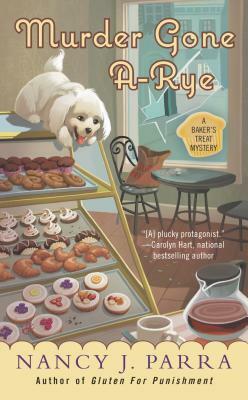 The second book in the Baker's Treat Gluten-Free Bakery series is out May 6, 2014. In this story my wickedly smart Grandma Ruth finds herself a person of interest in the death of her long-time rival Lois Striker. Grandma drags me into another investigation that uncovers an even older murder mystery where our home town hero is suspect number one. No one is who they seem and things get a little tricky for Grandma and me. As always there are yummy gluten-free recipes inside the book. To celebrate the release, my author will be giving away an author copy to one lucky person who leaves a comment and tells me what they would like to see made into a gluten-free treat. I'm still looking for the perfect gluten free cannoli recipe. How about you? Also sign up for the Goodreads giveaway of this book at the link below. Good luck! Giveaway ends May 03, 2014. I would sell my soul for a gluten free biscuit. OK, maybe not sell my soul, but it would make me deliriously happy! I don't eat gluten free, but I enjoyed your characters in the first book. If i had to be gluten free, German chocolate cake would be my first pick. Some really good gluten free blueberry pancakes. Thank you everyone. There is actually a gluten free cheese cake recipe in this new book - yum! The winner is Janet C! We will work on a good gluten free biscuit recipe. My author misses those, too. I would love to find a gluten-free chocolate chip cookie - the soft & gooey kind! I recently had bariatric surgery (I've lost 90 lbs so far) so I need to keep my fat content & sugar content both below 5 grams per serving & a friend of mine just went on a gluten free diet which has done wonders for her so I thought, well, maybe I can incorporate some gluten free recipes into my new, healthier lifestyle!